Record Breaking Afridi is Back with a Boom & Here to Stay! A day that was supposed to be about Pakistan's new well balanced ODI XI turned out to be a Shahid Afridi comeback show; what a great comeback show it was. In the matter of 109 deliveries, Shahid Afridi turned the match upside down and made the day his own. It was a record breaking comeback. In 55 deliveries, he smashed 76 runs with the help of 6 boundaries and 5 sixes - in a match where no other batsman could hit more than 2 boundaries! 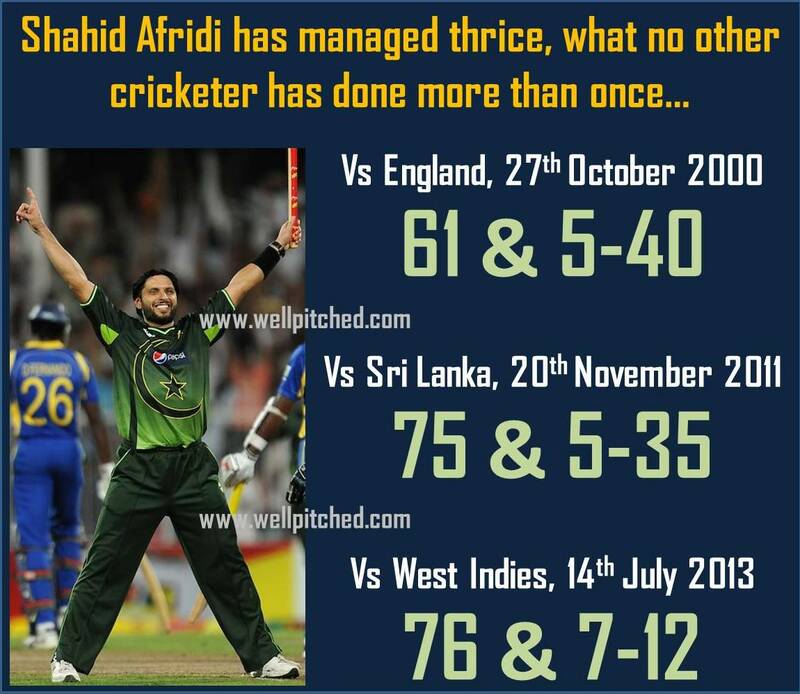 In the next 54 deliveries, Afridi picked up 7 West Indian wickets while giving away only 12 runs. Such single handed dominance in an ODI is extremely rare. There have been only 16 instances in ODI cricket where a player has scored 50 runs (or more) and picked up 5 wickets (or more). The feat has been performed by 14 players in 42 years of ODI cricket and only one cricketer has repeated it - not once but twice - Shahid Afridi! Last night was Afridi's third time; and in doing so, he also picked up his best ODI haul and created the record for the best bowling figures by a Pakistani, breaking Waqar Younis' record of 7-36 against England (2001). Afridi's 7-12 is now also the second best ever bowling performance in an ODI, behind Chaminda Vaas' 8-19, and ahead of the 7 wicket hauls of McGrath, Muralitharan, Bichel, Waqar, Aaqib, and Davis. Afridi could not have asked for a better comeback game than the one he got last night. He picked up his 30th man of the match award and increased his lead over all other Pakistani match winners with the most MOM awards. I can go on and on about Afridi's records for Pakistan - better to go here and catch up on what he has done for Pakistan cricket over the past 17 years. The pertinent question after last night's game is - "Is Shahid Afridi Back?" I think he is. Not because of his 76 off 55 - he managed a similar 80 odd against South Africa 3 ODIs before this one. Not because of his record breaking 7-12 either. Purely because he looked like his old 2011 self as a bowler. The drift, the zip of the pitch, the varying pace - it was all back. Shahid Afridi bowled like he owned the world, like he did during the period between 2007 and 2011, during which he was Pakistan's leading and the world's second highest ODI wicket taker. This is what Pakistan had been missing throughout 2012 and it was good to see it all come back last night. Afridi's critics are still complaining about how this performance will keep him in the team for another 5 years, how he has not been consistent, and how this is a once in a blue moon performance. I have serious concerns about such critics. Between the period 2007 and 2011 Afridi played 99 ODIs, in which he picked up 140 wickets at an average of 28.95 and scored 2013 runs at an average of 25.80. Only Mitchell Johnson picked up more ODI wickets during that period. And not to forget that during that same period he was the man whose performances led Pakistan to a World T20 Title, a World T20 Final, and semi finals of a World T20 and the ICC World Cup. In which world is that inconsistent? I agree that 2012 was a bad year for him. In fact, it was his worst year ever in his 17 year career. In 16 ODIs during 2012, Afridi picked up only 15 wickets at an average of 43; and scored 182 runs at an average of 15. 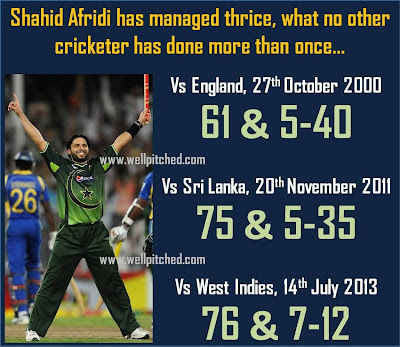 Afridi has not had this bad a year in ODI cricket since his debut in 1996. Did he deserve to be dropped after this? Definitely. Pakistan had the chance to try out new and young all rounders, but what they did instead was replace Afridi with Shoaib Malik, a cricketer well past his sell by date. Those crying over Hammad Azam not being given a chance, should be blaming the PCB selectors and team management for not giving young cricketers like Hammad Azam a chance while Afridi was on the bench. Malik did himself and Afridi's critics no favors at all, as his failure made the PCB turn back to Afridi. And now, Afridi is back and here to stay. I reckon that by the end of the year, Afridi might even be leading Pakistan's ODI team. Misbah's term as ODI leader is nearing its end, and Pakistan can't find a better man to lead them till the 2015 World Cup than Shahid Afridi. Afridi's bad phase has passed. Last night, Afridi looked fitter, hungrier, and he was back at his boom boom best. He is not inconsistent and definitely does not perform once in a blue moon. He is a match winning bowler for Pakistan and his presence on the field lifts the team like nothing else does. He is a pure match winner and he is here to stay for some more time for sure.